This is tom novak, co-director of the Short Term Gallery. It looks like the numbers of visitors to the gallery are increasing and with that so are sales. Perhaps as the blue skies return we're all a little more willing to venture out of our cozy wintertime shelters, whatever the reason it's nice to see folks out and about downtown once again. Here is the latest painting to come off my easel. It is part of a series of portraits I’m putting together for my show at Peterson’s Gallery (1925 Main Street, Baker City, OR) in April. The name of the woman in the painting is Judy Price, a very nice lady I met a couple of years ago. Even when I first met Judy I thought there was something a bit special about her, something I found remarkable and something I wanted to try to paint. I still can’t quite put a name on that something. As with all of us, this quality that I find noteworthy is no doubt an entire community of attributes all come together in one person which does make it seem like one could put a single name on that complete package, like saying she’s capable or she’s nice or she’s tough and with that one word you could so easily sum up all those ephemeral qualities that we each possess. But it’s not so easy as that is it? Of course not. But for some reason I became aware of the difficulty involved as my mind sifted through all the adjectives I usually fall back on to make sense of my surroundings or to unconsciously explain or quickly sum up individuals in one fell swoop … and that which I was struggling to put into words I knew I could paint. You, know, the old “picture being worth a thousand words” idea. So I eventually got around to asking her if she’d consider posing for me. I think it was during a chance meeting in Albertson’s that I actually found myself telling her I would like to paint her portrait. I still have no name for that quality in Judy that I find so remarkable and felt the desire to paint, but whatever it is I feel comfortable saying that I did capture some of it. 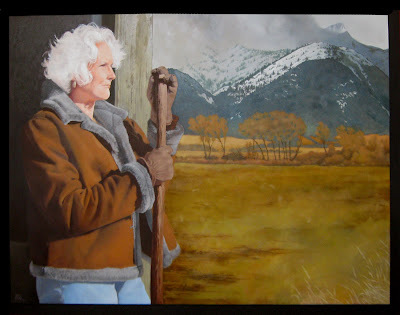 I wanted to paint her as being comfortable, even secure, regardless of what her surroundings were up to, so I painted her with an implement in hand, a shovel or pitchfork handle as if she’d been out working in the barn but just now took a moment out to look across the valley, perhaps she heard something, the screech of a hawk soaring overhead or maybe she’s thinking about the fence she’ll have to mend later today or even the grandkids coming this weekend … while still another winter storm rages in the mountains that make up the background. Maybe she’s thinking how it’s time for yet another winter, how another change of season is at hand. Change. Things Change. And through it all, season after season, the woman in this painting is prepared to weather that change, to not only weather it but to come out the other side, still there, still strong, still at peace with what is. Or maybe she’s just wondering if her husband has lunch made yet. Judy and her husband Tom came into the gallery last week just as I was putting the finishing touches in on her face. They liked the painting ... which pleased me beyond measure. As I’ve mentioned perhaps too many times before, the paintings I create have to satisfy me first, they are all about me, my growth, my becoming vulnerable to my surroundings. They reflect my ability to become aware, to be able to take down the walls of protection I have built around myself so that the beauty or the sorrow or the wonder or the sheer joy of this world can flow into me without restriction. I have to be able to go beyond merely looking at what is around me, I have to be able to really “see” what I am looking at in order to portray it which means I have to be as clear of energetic bottlenecks as is possible for me at the moment, only then am I, to my satisfaction, able to absorb what I am “seeing”. Only then can I get beyond what my mind says a thing looks like and allow myself to be in the place of really seeing that thing. Only then am I capable of simply being in the moment with whatever that thing is, whether it be a person or an orange or even something more abstract, like a thought. That state of being is actually a kind of non-structured mediation. And THAT is what being an artist is all about for me … the ability to bring myself to a place of peace by simply being completely in the moment with what I am looking at, studying, inspired by. It’s that state of finding that place of peace that is primary. The creating of the artwork, the actual “doing” is the vehicle by which I get to experience this, and it is secondary. The artwork that results from this process is simply the end product. Once I am finished with the creating of it, it takes on a life of its own and is appreciated or is dismissed by critics and the viewing public and all too often brings about the awakening of my ego. Which isn’t necessarily a bad thing as long as I recognize what is going on. But I have plenty of friends and family to keep me humble in those moments when I start to slip into that abyss of thinking how good I am, or am not. Anyway, when Tom and Judy were in the gallery appreciating the painting and so by association the one who created this fabulous work of art, that would be me, I was also able to totally and absolutely enjoy that moment of appreciation and the stroking of my ego. And, once again I remind you, that all this I’ve been writing about as I attempt to make sense of it in my own head and shamelessly use you as a catalyst and captive audience for doing so, is simply my opinion. Other artists create for completely other reasons. And the paths to peace are to be found everywhere and by anyone who cares to look for them. Art and its practice is simply the means that works best for me. The painting is wonderful and your words, so thoughtful and insightful.You are poet.